The Block, Four Corners high on Monday. 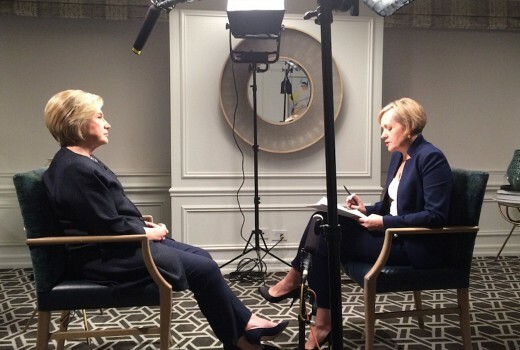 ABC’s Four Corners interview with Hillary Clinton won its timeslot with 844,000 last night. ABC matched Seven on primary channels last night, with Four Corners preventing Have You Been Paying Attention? from winning the slot, on 688,000. The Block had its best Monday this season at a cool 1.44m viewers, sending Seven’s profile doco on Michael Hutchence to a disappointing 526,000 viewers, with TEN’s Family Feud special in fourth place on 416,000 viewers. Seven News, The Chase and ACA all won their slots. Nine network won Monday with 30.0%, then Seven 25.0%, ABC 21.3%, TEN 16.8% and SBS 6.9%. The Block was #1 for Nine with 1.44m viewers then Nine News (993,000 / 990,000), A Current Affair (847,000), Law & Order True Crime: The Menendez Murders (548,000) and Hot Seat (484,000 / 283,000). Seven News (1.00m / 985,000) led for Seven then Home and Away (725,000), The Chase (575,000 / 369,000) and Michael Hutchence: The Last Rockstar (526,000). Four Corners (844,000), ABC News (744,000), Media Watch (729,000), 7:30 (687,000), Australian Story (630,000) and Q&A (541,000) comprised ABC’s night. Have You Been Paying Attention? (688,000) was best for TEN then The Project (631,000 / 373,000), TEN Eyewitness News (426,000), All Star Family Feud (373,000), Family Feud (316,000) and Man with a Plan (291,000). On SBS it was River Cottage Australia (185,000), 24 Hours in Emergency (183,000), The World’s Most Extraordinary People (171,000) and SBS World News (144,000). Shaun the Sheep again best multichannels with 243,000. News Breakfast: 107,000 / 40,000. Wow this production of the ( cringingly titled ) The Last Rockstar ( yuk what a w–k ! ) really took 2 years to make ? It looked like it was thrown together after a few very long lunches on the expense account turps. Probably cost a dollar for every viewer. Does this constitute another “hit” from Seven ? I lasted on the Hutchence doco until the first ad break. Not only did it not grab me but I was mildly bored. I’ve said it before – my time is too important to waste on mediocre television. I’m sure that I will be able read about the “stunning revelations” somewhere in a few minutes instead of needing to commit 4 hours of my time. Ditto. The “bombshell” was so explosive it hasn’t even received a mention on 7Yahoo. Maybe after it airs tonight. I really didn’t expect more than 500k for Michael Hutchence: The Last Rockstar. I didn’t watch it, but surely whatever it covered could have been done in a yahoo7 entertainment article. Dear TV decision making people, hyper promoting your new ‘must see’ ‘event’ with the ‘one Australia’s been waiting for’ may seem like a good idea, making another so called documentary with ground breaking secrets about someone who has been deceased for 2 decades may also seem like a good idea, or a mini series on any other once big aussie celebrity may seem like a good idea, its not. Sincerely Aussie TV Viewing Audience. Seven have nothing to compete against The Block at the moment, and their police and customs shows aren’t pulling many people these days. So they made The Last Rockstar cheaply from old footage a few interviews. The alternative is probably more internet cat videos. THR did better than Bull’s season premiere and Wake In Fright. My main issue was finish time (the Sydney EPG, Foxtel EPG, online Guide and the paper had 4 different times covering 40 minutes) so I could figure out when The Blacklist would be on. In the meantime I watched Three Stories and Honeymoon, two brilliant episodes of House. The Last Rockstar was made over two years through news dept. including filming in several countries. Did you watch the show?